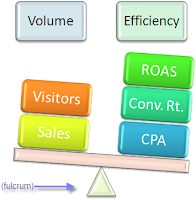 Efficiency (ROI, CPA, ROAS, Conversion Rate) and Volume (Revenue, Orders, Clicks, Cost) have an inherent inverse relationship in paid search marketing. In other words, as an optimizer improves efficiency, volume typically suffers. When they increase volume, efficiency suffers. The seemingly simple ability to scale both volume and campaign efficiency simultaneously is one of the great differentiators of PPC optimizers. As a search marketer, client, or prospect, refuse to look at a single graph or listen to a single stat on campaign improvement unless it addresses both efficiency AND volume. I implore you, good people. Unfortunately, nearly every industry case study I read or optimization story I hear only tells half of the story – the efficiency part. Yes, I can improve ROI by 1000% in one month too: cut all but my 10 tail terms that have an 80% conversion rate. But I’m left with 8 sales to go with my super stellar efficiency stat. I guess I just won’t mention that part to the client and add a thicker trendline to my ROI graph. Maybe they’ll put the cost savings toward a nice newspaper ad to drive sales volume. Only the best paid search optimizers can employ the tactics to grow volume and efficiency at the same time. There is no single automated technology, no revolutionary page design, no award winning copywriter, no master media planner, and there is no PhD in applied mathematics that can achieve this success by themselves. Expert optimization is an art form; utilizing the right mix of aforementioned sciences with some intelligence, experience, and gut to grow volume and efficiency together. Together we shift the industry paradigm of single-sided success stories, starting now.